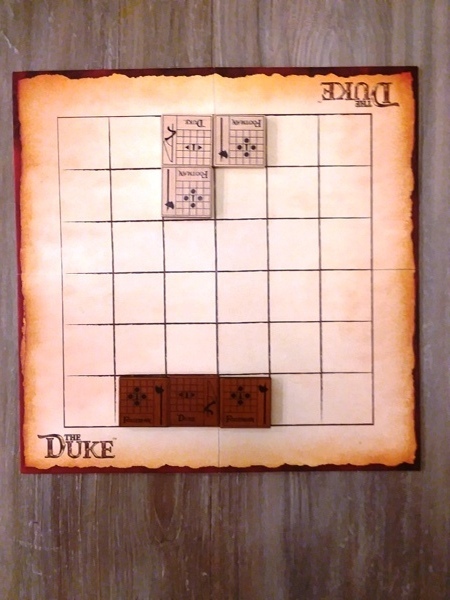 The Duke Lord’s Legacy is a medieval/fantasy-themed (somewhat) abstract strategy game designed by Jeremy Holcomb, Joe Huber, Stephen McLaughlin, Randall N. Bills, and Loren L. Coleman and published by Catalyst Game Labs. 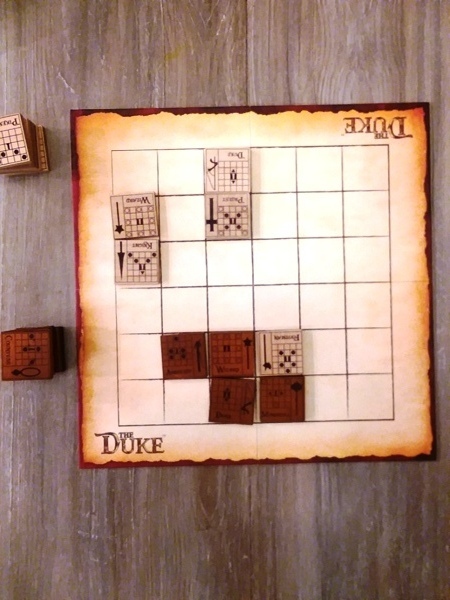 The Duke is a Chess-like abstract strategy game, with a medieval theme layered on top, where tiles take the place of pawns whose moves are printed conveniently on the tiles. Lord’s Legacy is the new edition of The Duke that includes the original game and the 8-tile Arthurian Legends expansion to expand your gameplay. Although the game is much like the Chess of old, it is a definite new age, enhanced version with a lot more variance in gameplay. The first aspect that is different is the use of tiles instead of pawns and the ability to add tile expansions to change your gameplay. The second difference is that each tile, which is has a type like a pawn in Chess, has two different movements instead of one. Each movement is printed on one side of the tile; after the tile acts, it is flipped and the other movement becomes the active one. The third difference is that you blindly choose tiles from a bag and deploy them on a turn as opposed to having all tiles available at the start of the game. This adds to the randomness and need-for-strategy of your gameplay. I am already a fan of Chess, Checkers, and Stratego. 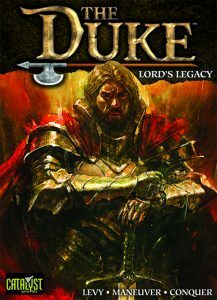 To me, The Duke Lord’s Legacy fits in that same category as it’s like a wargame that maintains strategy and quick-thinking. I actually played with my 9-year old daughter, who caught on right away, and we both had a very good time. I will admit that luck seems to play a part in gameplay when it comes to blindly grabbing tiles, but in the end strategy can win and bad moves can easily lose. In fact, our first game she won very quickly, but I learned by lesson the next time. She still one the second time, but the game lasted much longer. 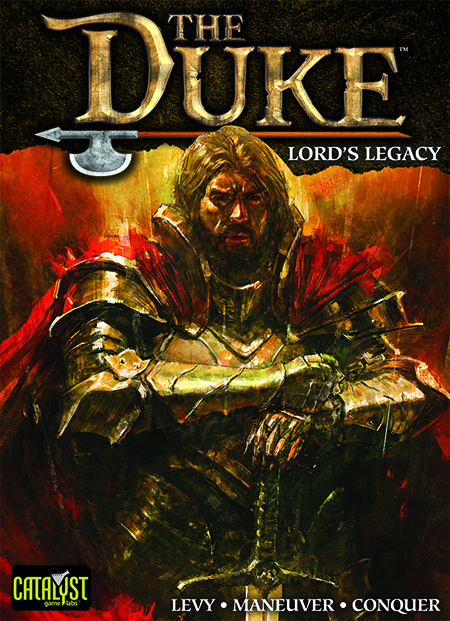 The Duke Lord’s Legacy can be a simple, quick game at its roots of gameplay. However, because it’s a new age game, the rulebook includes expanded play variations and new rules when incorporating the Arthurian Legends tiles. It also includes a number of tile expansions that you can incorporate to keep things interesting. It is only a 2-player game, but this isn’t necessarily a problem. A slight limitation, but sometimes you just need a really good 2-player game that doesn’t feel like a slimmed-down 4-player game. I would love to see if a multi-player version ever comes out, but this is by-far my favorite 2-player game to date!